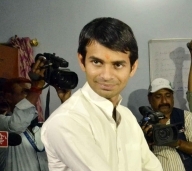 Patna, March 29 (IANS) Tej Pratap Yadav, the elder son of former Bihar Chief Minister Lalu Prasad, is likely to contest the Lok Sabha polls against the father of his estranged wife and RJD candidate Chandrika Rai from the Saran seat. The development comes a day after Tej Pratap Yadav announced that he had resigned as the patron of the Rashtriya Janata Dal's student wing after being sidelined by his family and the Rashtriya Janata Dal (RJD). "Tej Pratap felt insulted and humiliated over the party's decision to field Rai from Saran. He will contest the polls against him as an Independent candidate," a party leader said. Aishwarya is Chandrika Rai's daughter and granddaughter of former Chief Minister Daroga Rai.